The Final Theory -- What Is It? What is The Final Theory? Simply put, it is the famous Theory Of Everything finally made manifest in a book! 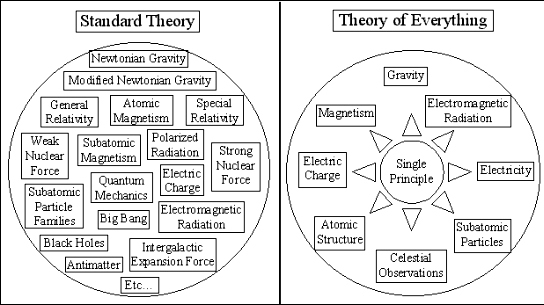 The diagram below shows today's patchwork of unexplainable theories (Standard Theory), alongside the abstract concept of a final Theory Of Everything that rids us of all our mysterious beliefs by revealing the true nature of our universe -- a single, simple unifying principle that explains everything. This is the ultimate goal of science and one of humanity's greatest quests to understand our world. It has finally arrived .. The Final Theory is here!